PROP Sophie Hemming who starred in England’s World Cup victory this summer has announced her retirement from international rugby. Sophie, 34, a vet in Staple Hill, was part of the winning team when England beat Canada 21-9 at the Jean-Bouin Stadium, Paris in August. Following the much-talked about victory, Sophie told Downend Voice she wanted to take her time to reflect upon her future as she is one of the older members of the England squad. Now she has decided to retire from the international scene but will still continue to play with Bristol Ladies in the RFC Women’s Premiership. She hopes to stay involved in the England set-up in some capacity as a coach, mentor or even a commentator. Sophie, who works at Avenue Vets in Pendennis Avenue, has proved herself to be a world class tight-head prop since making her début in 2007. She has since gone on to amass an impressive 71 caps, compete in several winning Six Nations campaigns and two rugby world cups. Sophie said: “I wanted to take a bit of time after the world cup to think about whether I wanted to continue playing for another season and play another Six Nations or stop at this point. “I decided that having won the Six Nations six times and being a world champion, I was in a pretty good position to decide to hang up my international boots. “I wanted to go out on my terms, at the top of my game and not get to the point where coaches stop selecting me or my playing levels start to deteriorate. Sophie, who lives in Frampton Cotterell, settled in South Gloucestershire from her home town of Norfolk after studying at Bristol University. In 2004 she qualified as a vet and has worked at Avenue Vets ever since. She said: “It’s been fantastic but it’s been incredibly challenging juggling getting up at 5.30am, going training then doing a full day’s work at the vets and then training again after work. It’s hard to sustain. Sophie said her career as a vet would now take centre stage. “Avenue vets have been so supportive of my international career and it’s important to me to repay that now. It will be refreshing not having to stress about the constant demands of juggling weekend rotas and being on call. 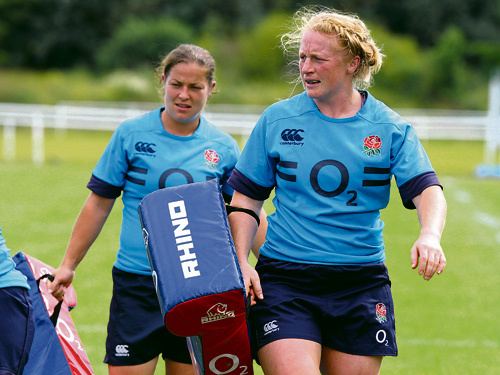 Sophie said she would treasure her memories from her international career: “Losing the World Cup final in 2010 against New Zealand so narrowly -13-10 - was devastating but it provided me with the drive to carry on and keep training and give that extra bit to get to to world cup final this season, which was the best memory of all. Sophie said playing with Bristol is still high on her list of priorities. Although Sophie continues to be busy, she has managed to fit some mountain biking into her schedule, taking part in a recent race.